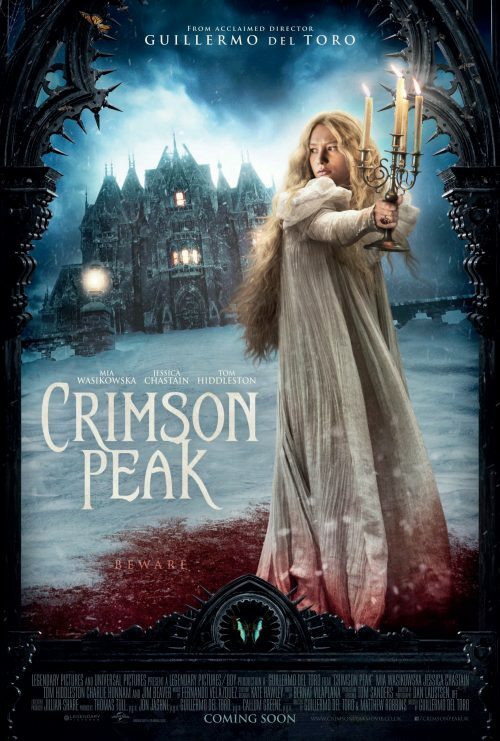 From a great studio for horror and a director who makes classic horror movies for the modern audience comes Crimson Peak. The first being Universal Pictures who have given us some of the greatest horror films of all time and Guillermo del Toro, the director of Pan’s Labyrinth and the Hellboy series comes a new take on a classic haunted house tale. The international trailer is below for you amusement. There isn’t a UK version as yet bot the below trailer does pique your interest in the film and makes you want to know what will happen to our heroine. The second thing we have is the poster for the film. It does set the scene of what’s going to happen, the classic style that the director has managed to invoke and how evil the house looks. Not only have we got the above great trailer but a great set of images to go with the ones that we already have been sent – not only that but you can also watch the teaser trailer over here as well.